Ryan is a shareholder with the Firm and focuses on state and federal litigation, primarily in Texas. Ryan was born and raised in Austin, Texas. He earned his bachelor’s degree, majoring in Finance, from Georgetown University in Washington, D.C. Following graduation, Ryan returned to his home state of Texas and enrolled at the University of Houston Law Center, earning his Juris Doctorate. Initially, Ryan worked for a boutique litigation firm, and his practice focused almost exclusively on defending companies from civil litigation matters, including both personal injury defense and commercial litigation. Ryan helped to defend oilfield service providers, trucking companies and employers in the offshore and maritime industry. For his work, Ryan was recognized on the 2012 Rising Stars list by Super Lawyers magazine, a Thomson Reuters Company. This recognition is conferred upon no more than 2.5% of attorneys in Texas that have practiced for 10 years or less. After handling a few matters for persons and companies that were wrongfully injured or damaged through the fault of others, Ryan decided to exclusively focus his practice on such cases. He joined a prominent plaintiff’s personal injury firm in order to further this goal. There, Ryan solely focused on helping injured persons seek justice against the persons or companies that harmed them. Ryan handled or assisted on a variety of cases arising under the Jones Act, third-party cases under the Longshore and Harborworker’s Compensation Act and Texas Worker’s Compensation Act, OCSLA matters, complex products liability matters, commercial auto-accident and non-subscriber cases, oil field injury cases, as well as refinery and other work-place injury cases. During this time, Ryan participated in trials in multiple counties in the state of Texas as well as in the state of Michigan. In addition, he helped to prosecute civil cases in California, Kentucky and Tennessee along with cases in Texas and Louisiana. Ryan gained valuable experience and satisfaction in helping recover dozens of settlements as well as verdicts for injured victims. After handling matters at both defense and plaintiff firms, Ryan decided to open his own practice in order to focus on representing both the injured worker in personal injury matters and the small business owner in commercial litigation. Ryan’s experience in both defending civil lawsuits as well as prosecuting them gives him unique insight and ability to evaluate your case from multiple perspectives. 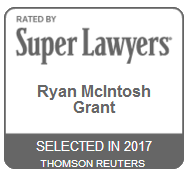 Since transitioning from defense work to plaintiff’s personal injury litigation, Ryan has been selected five consecutive years (2014, 2015, 2016, 2017 and 2018) to the Rising Stars list by Super Lawyers magazine, a Thomson Reuters Company in recognition of his work on behalf of injured workers and accident victims. Above all, Ryan is an aggressive advocate and will prosecute your case with the personal attention that can’t always be provided by larger firms. Whether you have been hurt through the fault of someone else or have a pressing legal issue for your company or small business, Ryan is here to help. Ryan is a member of the State Bar of Texas as well as the Louisiana State Bar Association. He is admitted to practice before state courts in Texas and Louisiana and welcomes the opportunity to assist you or your company in any venue in these state courts. Ryan is also admitted in multiple Federal District Courts in Texas and Louisiana.